Pinotage Comes of Age, states The Wine Society. "Pinotage is a Cape calling card reinvented for today’s more demanding palate. It now comes in a multitude of styles and the best examples, from a range of climates, are fine, ageworthy reds". And so the Society has decided it's time to include a Pinotage catagory in their Fine Wine List. 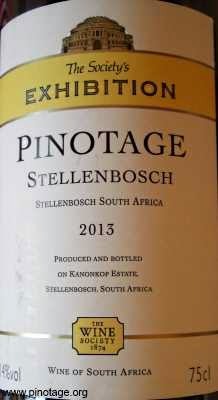 The Wine Society has also added a Pinotage to their premium 'Exhibition' own label range. 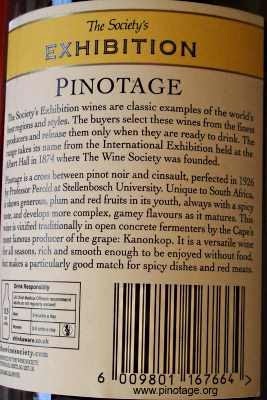 The Exhibition 2013 Pinotage is produced by Kanonkop and I suspect it's a re-badged 'Kadette' Pinotage. The Wine Society, founded in 1874, is the world's oldest wine club and is a mutual society solely owned by its members.